In the early 1950s, Chadwick was transitioning from the intricate , floating mobiles of the late 1940s to his first sculptures. He uses Studies for Sculpture to showcase this pivotal moment as he incoporates moving elements, often balancing, into some of his most important works such as Bullfrog, 1951, Barley Fork, 1952 (Venice Biennale 1956) and, perhaps most similar to the drawing to the middle left of Studies for Sculpture, Balanced Structure III, 1952 (Venice BIennale 1956). 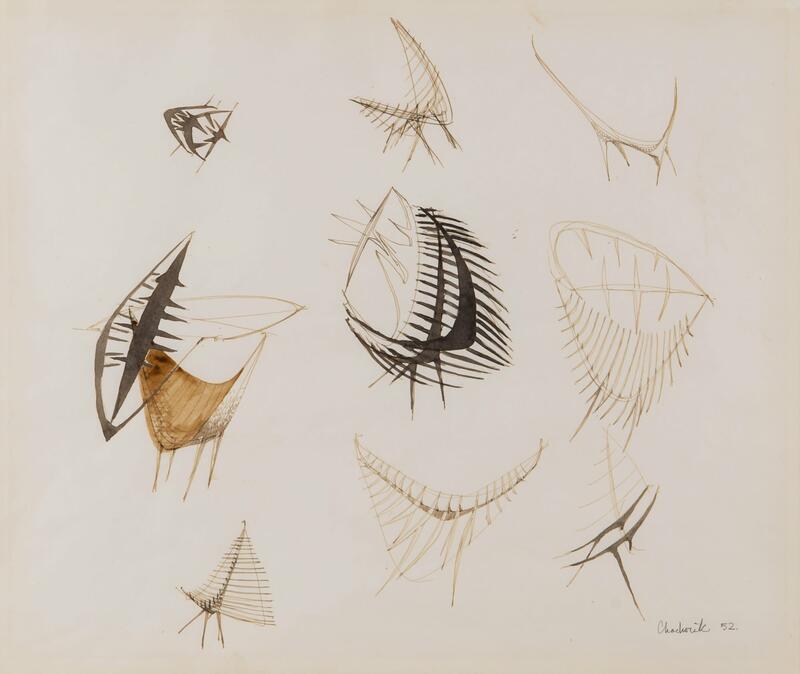 While the Chadwick estate have a number of drawings for sculpture, Studies for Sculpture, is a very rare example of Chadwick setting out his new stall in a more formal drawing of a group of sculptural ideas.